Labeling allows traceability per ISO 9000 . Our Metal-in bag is a shielding bag that offers enhanced durability. The outer layer is static dissipative 48-gauge polyester. A metalized layer is buried between the polyester and an antistatic polyethylene (PE) inner layer. The aluminum is an excellent ESD shield and the PE prevents tribocharging of the bag contents. All bags are labeled with product number, manufacturer’s name, and lot number. Light transmission of 40% allows for easy identification of contents. 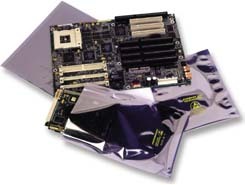 Metal in ESD Shielding Bag is superb for packaging of static sensitive components, PC boards and electronic assemblies.